Here at VS ADVERTISERS, we provide complete support/AMC to our customer /Other vendor customer who has sign board and facing issue in it. we have complete arrangement of staff who can easily identify signage issue like electrical, repairing etc and they can rectify issue within few hours. Backed by the skilled professionals, we are involved in providing Sign Board Repairing Service. 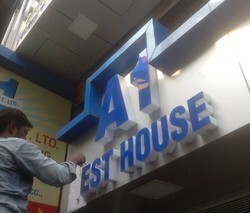 Best quality of Sign Board Repairing Service is provided by us to customers as per their requirements. We are highly acknowledged organization engaged in providing Sign Board Repairing Service. As a principal business name, we have been engrossed in the realm of delivering Sign Boards Repairing Service to our customers. Rendered under the direction of trained personnel, these offered services are widely recommended and cherished. More to this, our executives spend some-time with our personnel to understand and comprehend to their needs in an accurate manner. Banking on the skills of our qualified team of professionals, we are involved in providing Sign Board Repairing Service. At most reasonable rates, we are providing Sign Board Repairing Service to our patrons. Backed by skillful experts, we are proficient in Sign Board Repairing Service. These services are enormously appreciated in the market due to their timely completion. Our professionals render our offered service employing the advanced techniques. Offered services are rendered in varied forms and terms that meet on customer’s demand. We bring forth vast industrial experience and expertise in this business and are involved in providing LED Sign Board Repairing Service. Backed by our skilled professionals, we are involved in providing Sign Board Repairing Service. By keeping our sync with the evolutions taking place in this market, we are involved in presenting Sign Board Repairing Service. These provided services are imparted by deft personnel who hold enormous knowledge in their respective arena to retain exactness, effectiveness, and flexibility in our services. We have been counted amongst the most trusted names in this domain, engaged in providing Sign Board Repairing Service to our clients. Matching up with the ever increasing requirements of the customers, our company is engaged in providing Sign Board Repairing Service. Our nationwide network of licensed and bonded professionals is available 24 hours a day, 7 days a week. That means you won’t have to wait around for sign repairs or maintenance requests. Our team of experts provides rapid turnaround from your initial request through project completion. And most repairs are completed in a single trip. 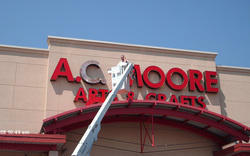 Our company is a master in providing Sign Board Repair Service.